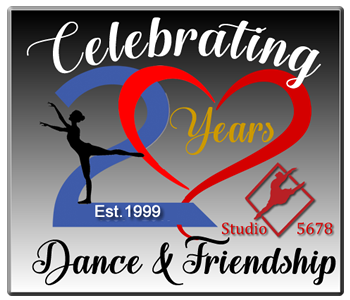 Studio 5-6-7-8 is excited to begin their 20th year of dance and tumbling instruction. Our studio approaches dance in an enjoyable and creative manner, with an emphasis on technique as well as on performance. We encourage self-respect, self-discipline, and self-confidence, along with respect for others through our professional and progressive levels of instruction. We offer a variety of recreational and competitive classes for ages 2 and up. Some of the styles we teach include hip hop, tap, ballet, contemporary, clogging, jazz, and pom. We also have some unique classes such as Shake and Sing, Tumbling/acro, and Tiny Tots. Dance is a conversation between the body and the soul.